Summer B.R.E.A.K. 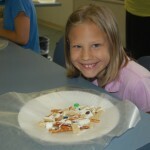 (Brain Riveting Enrichment Activities for Kids) was held June 13-17. 230 students participated in the one week program taking a variety of classes such as Super Science Experiments, Chess, Duct Tape Creations, Kids in the Kitchen, Art Mania, Dodgeball. 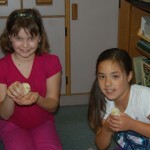 A total of 15 classes were offered for students who had just completed grades 1 or 2 and 24 classes were offered for students who had just completed grades 3 to 6. Students just completing kindergarten and those headed to kindergarten in the fall were also able to participate. This was the 16th year for Summer B.R.E.A.K., a self-funded summer program.